If you're an Amelia fan, then you must have loved every bit of Grey's Anatomy Season 11 Episode 13. I can remember a time when I honestly didn't care all too much for Dr. Herman. Now, I've found myself rooting for Amelia to destroy the "fat-cheeked baby tumor" and save Herman's life. As Amelia confidently described during her lectures, Herman's masterpiece of a tumor requires a methodical plan of attack. She's estimated that it will take seven surgeries and at least 18 hours. I loved seeing how sure Amelia was throughout most of the installment. Then, when she reached her breaking point in front of Stephanie, I appreciated the reminder that Amelia was just a human. She was scared, nervous and much more, but she is also like the tumor – fierce, intimidating and aggressive. As each week progressed, the auditorium grew more crowded during Amelia's weekly lectures. Meanwhile, Herman and Arizona were trying their best to tackle four months worth of surgeries in only eight weeks. Herman also had to squeeze in weekly radiation treatment on top of her challenging deadline. While Herman and Arizona continued to bond, their newfound friendship made it difficult to watch when Herman was clearly frightened during her radiation therapy, and then again when it was time for Herman to put her trust in Amelia. Each time Amelia detailed the intricacies of Herman's surgery, I couldn't help but wonder why there weren't as many familiar faces in the crowd. It was nice of Owen to reach out to Amelia and remind her that he was there to listen, but I thought Meredith and the other doctors could have shown more support either in the lecture hall or even elsewhere. I'm glad we got a small dose of Omelia with their awkwardness and all. Did you want Amelia to call Derek? I knew she wouldn't, but a part of me was hoping she'd receive an encouraging text or email from her big brother. Can I just say that after April's heartbreaking story and then with all of the recent surgeries with pregnant mothers and their babies have made it really difficult for me to watch? Seriously! Expectant mothers, I totally am struggling right here with you. Overall, I thought "Staring at the End" was interesting and illustrated just how incredible Amelia really is. This won't go down as one of my favorite episodes ever, but I was most certainly intrigued and loved seeing Amelia shine. I'm curious to see what happens next as Amelia's reached the point of no return in trying to save Herman's life. 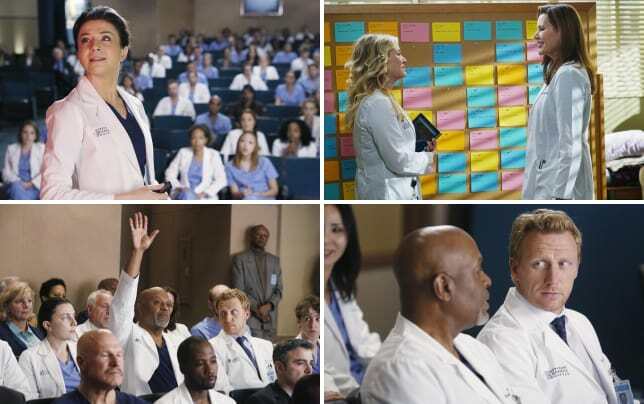 NOTE: Grey's Anatomy Season 11 Episode 14 will be titled "The Distance" and air on Thursday, March 5.